In the face of rapid environmental change across the globe, sustainable practices and environmental responsibility are increasingly salient topics of conversation in business communities. In various ways, little or large, small businesses from industries across KC have approached the green wave from their own angles. These companies have taken a proactive stance in providing solutions for other businesses, all while protecting the environment. Built is changing the way the construction industry looks at sustainability from the ground up. Headquartered in the Crossroads Arts District, Built was founded in August 2015 by David Anderson, Russ Branden, Mark Brandmeyer and Kerri Brocker. Built has completed projects within the health care, corporate, government, industrial and educational sectors. Through various practices—such as its automated construction building process, minimizing waste on construction projects and use of recycled materials—Built stays “far ahead of the curve” on offering sustainable solutions, according to André Davis, corporate engagement/business development executive. “Built leverages its technology platform to build more efficiently because the construction industry hasn’t adapted so easily to current times,” Davis said. This reconfiguration process includes reusing 70 to 80 percent of a building’s original materials when Built is on the project. The firm repurposes other materials by recycling denim to use as insulation within the walls, melting down aluminum pieces to make new extrusions and reusing glass to make street signs. Built also uses virtual reality to digitally design its projects, drastically reducing its paper usage. 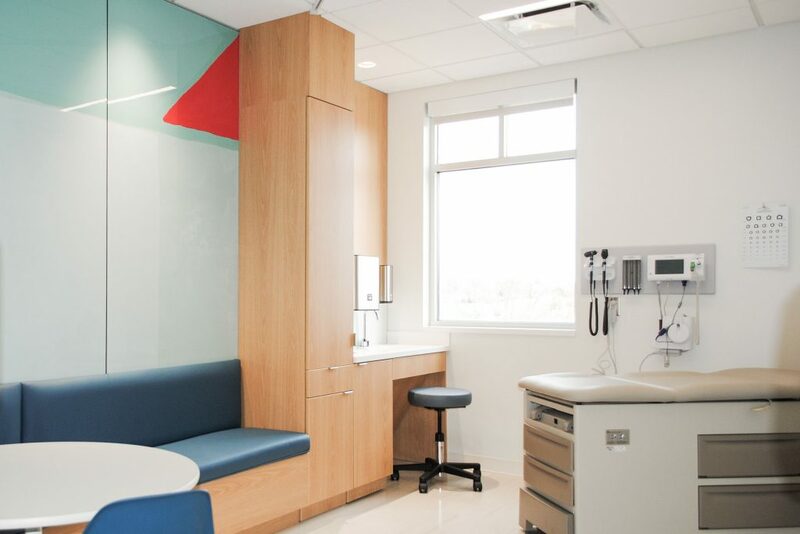 Built’s premanufactured approach allows for a rapid construction process, more durability, higher-end finishes and easy access into the cavity of the walls when needed. The firm is one of the only companies in the country to become a partner with national interior construction company DIRTT Environmental Solutions—an acronym for Doing It Right This Time—which specializes in prefabricated automated construction. Built co-founder and DIRTT representative Kerri Brocker started working with DIRTT 10 years ago. Now, she helps Built’s team to implement DIRTT’s construction technology where it makes sense. “We’re at this pivotal point where the construction industry is booming in Kansas City, but the question is, how will they keep up? That’s when Built should be seen as a resource to other general contractors. We actually help them build better and faster while assisting them in working more efficiently and minimize waste,” Brocker said. Currently, Built has expanded its Kansas City location to include St. Louis, and one of its upcoming projects is the brand new Johnson County Courthouse. Going forward, Davis and Brocker want to continue expanding awareness on green practices within interior construction and waste management. Like Built, Exceptional Waste Solutions also aims to provide green solutions to the construction industry. Launched in 2016, EWS is a waste management consulting firm that manages waste removal for construction projects. EWS is a Women’s Business Enterprise (WBE), a Disadvantaged Business Enterprise (DBE) and a Small Local Business Enterprise (SLBE) headquartered in Kansas City, Mo. CEO Alexis Albright was inspired to start EWS after working in construction sales for a Fortune 200 waste company, where she “saw a niche” need for a strong waste management consulting business. In addition to providing waste removal services, such as portable toilets and dumpsters, EWS focuses on making sure companies meet recycling certification requirements for their projects such as LEED and Green Globe. 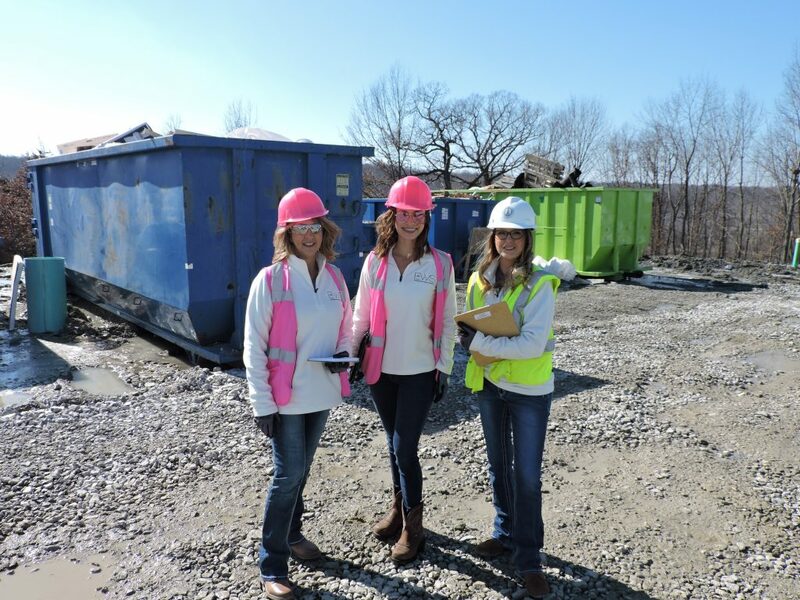 Albright and the two others on her team work with clients on their projects from beginning to end, starting in the conceptual phase and closing with the waste management services required after a project is finished. EWS also provides direct reporting so companies can analyze how they stack up against their goals. Going forward, Albright wants to continue her company’s move into national markets and to help clients across the country, as well as to keep promoting LEED adherence. Access Records Management is adding a green streak to a traditional records storage company. Within its 8,000-square-foot warehouse in Belton, Access Records has provided off-site records storage, shredding and scanning services for companies’ paper documents for 11 years. After noticing the amount of paper that was being put in the shred bins that wasn’t confidential, such as newspapers and magazines, CEO and co-founder Stacie Smith wanted to take a more environmentally friendly approach and created Business Recycling Solutions. 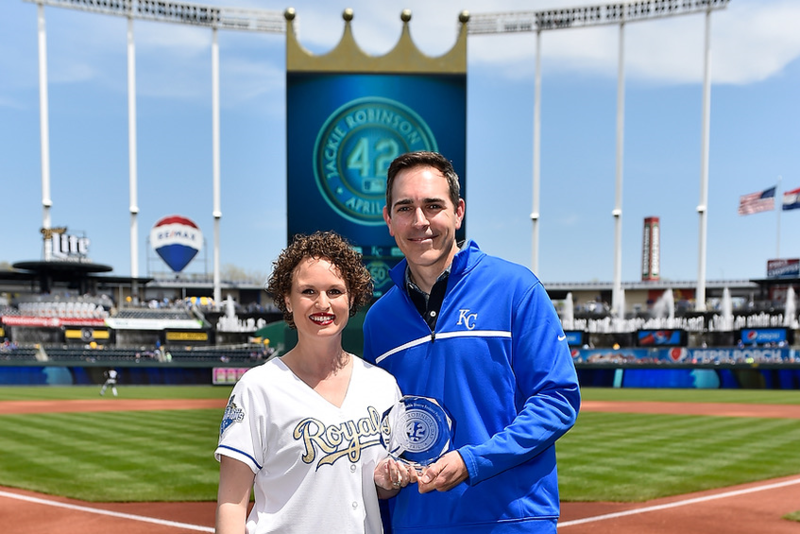 Stacie and Brian Smith receive an award from the Kansas City Royals. For this reason, Smith and her husband Brian provide a recycling service for their clients, which involves driving throughout the Kansas City area every day to collect companies’ recyclable products, such as nonconfidential paper, cardboard, aluminum and hard plastics. Business Recycling Solutions also provides annual certificates of sustainability to let clients know how much electricity, oil and trees they’ve saved throughout the year. Its green incentive, the “80/20 Challenge,” encourages businesses to recycle 80 percent of their trash. Access Records is a woman-owned business that focuses specifically on local customers—and right now, Smith isn’t interested in national expansion. In celebration of Earth Day this year, Smith’s companies are recycling broken or unwanted office chairs April 22-26. The service is open to any business. For 12 years, Good Energy Solutions has been a bright spot in Kansas City’s solar power industry. Started in 2007 by Kevin and Shana Good, Good Energy Solutions is a full-service energy partner that provides consulting and services within electrical, solar energy, energy efficiencies and energy management. Its solutions reduce energy use, lower demand charges and create clean energy from the sun. In starting their company, the Goods wanted to educate clients on the benefits of solar power and energy conservation and to provide green solutions that help customers save money. The GES team transports a solar panel. “By helping others go solar, we can help customers reduce their energy costs and become less reliant on fossil fuels used by centralized utility power plants,” Shana said. “Distributed generation can lead to a more reliable energy grid that’s less impacted by natural disasters and less vulnerable to cyber-insecurity. 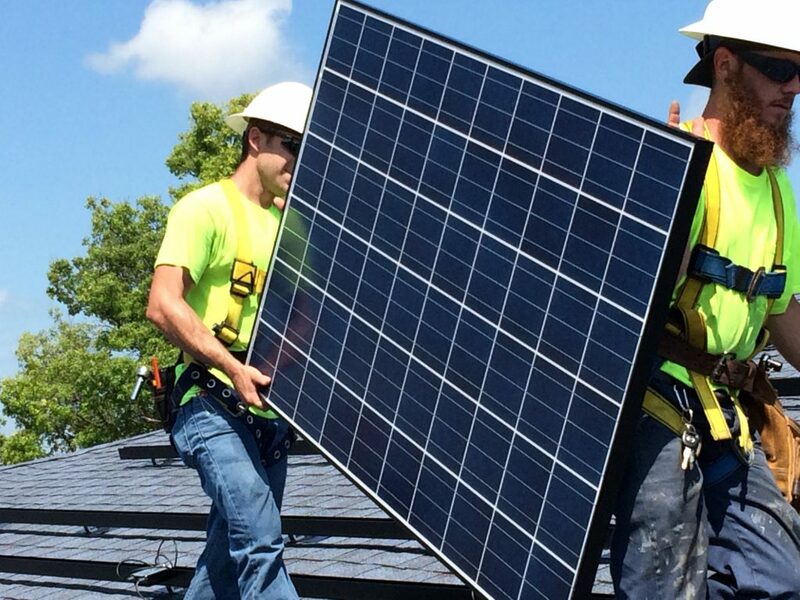 Good Energy Solutions’ services aren’t only helping keep Kansas City green—they make good business sense, too. “We combine technologies like energy monitoring and energy storage with solar to help businesses use their energy more efficiently and reduce their demand charges and energy costs,” Kevin said. Good Energy currently staffs 21 employees and is looking to add to that number in 2019. Some of the company’s upcoming commercial projects include bringing solar power to 10 Commerce Bank locations across Missouri and participating in the construction of a solar farm in Baldwin City, Kan.
“The solar industry is rapidly growing, and we continue to see the scale of our commercial projects increase,” Kevin said. “We see increased interest especially in areas that offer rebates and incentives for solar like KCMO.